While his form looked competitive, prospects escalated the minute Ali Baba (5 g Savabeel – Dreamworks, by Maroof) walked into the birdcage ahead of winning on 25 July at Matamata. Often on edge and threatening to sweat before racing, Ali Baba appeared almost nonchalant before the $11,000 Norwood Farm Machinery Rating 70 2000 metres, which in turn transpired into a four and a quarter length victory – commentator George Simon summing up the performance, saying: “He was going to win a long way out”. Settled eighth by Shafiq Rusof, Ali Baba improved ominously to fourth at the 600m, sailed to the lead 400m out and turned the race into a procession. “He jumped okay and once he got cover he settled down very well,” Shafiq said. “I was very happy with the way he travelled and in the last 600 metres when I brought him out, once he saw daylight he did it himself and just took off in the straight. On Heavy10 footing, Ali Baba ran the 2000 metres in 2:13.6, last 600m in 39.9, shortening late to outright favouritism and $3.60 & $1.70 on the NZ TAB tote. In the colours of owners Barry & Deirdre Neville-White, along with Ballymore Stables (NZ & Aust. ), Ali Baba was recording his third victory on the home track and may have also prolonged a planned jumps career. Ali Baba had performed creditably for third in his first hurdle trial after finishing sixth last start, in the Rating 65 1600 metres on 24 June at Te Aroha, and seems to have turned the corner for the experience. “He’s been a good horse in the past, but the jumps trial and a fair amount of jumping has brought him back on course, hopefully,” said Pam Gerard, who co-trains with Mike Moroney. While Ali Baba may have earned a reprieve from jumping at this stage, Gerard added: “I do think he’s pretty special as a jumper”. Ali Baba was selected as a yearling by Paul Moroney and purchased for $70,000 at the 2014 New Zealand Bloodstock Select Sale, from the draft of Kirkwall Thoroughbreds. His dam, Dreamworks, won the Royal Stakes (Gr. 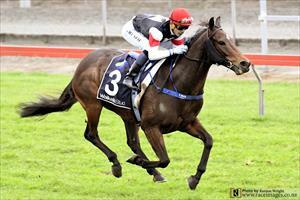 2, 2000m) and grand-dam Slanchyvah (Kaapstad) finished third in the NZ Oaks (Gr. 1, 2400m). From the family of Grey Song (Unbridled’s Song), winner of the Blamey Stakes, Chairman’s Handicap, St Leger, and second in the Caulfield Cup, and Herbert Power Stakes, with A$1.9m in prize money, Ali Baba carries a Sir Tristram cross, through Zabeel, the sire of Savabeel, and Kaapstad, the sire of Slanchyvah. Fly To The Moon was strapped by Pavin Kumar.